In these daily posts I have mentioned--on more than one occasion, I'm afraid--that in all my years of college and graduate school I never read a woman writer before Jane Austen. I should also add that I had only one American literature class as an undergraduate, and only one more as I was completing my Ph.D. coursework. 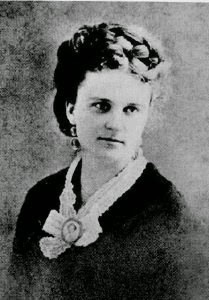 So I never read the work of the American novelist Kate Chopin (born on 8 February 1850). In fact, I am not alone--her greatest work, The Awakening, was published in 1899, but it was widely condemned for its treatment of marriage and adultery (a wife's adultery, that is). The book didn't earn her much money in royalties, and after her death, Chopin's name--and her work--fell into obscurity. Although one book on Chopin's short fiction was published in 1932 (Daniel S. Rankin's Kate Chopin and Her Creole Stories), the re-awakening of interest in Chopin occurred during 1969, just as the second-wave feminist movement was taking hold. (Ironically, because Chopin did not consider herself a feminist or support women's suffrage.) Per Seyersted, a professor of American literature in Oslo (yes, that one--Oslo, Norway!) published two works on Chopin: Kate Chopin: A Critical Biography and The Complete Works of Kate Chopin. Despite the revival of critical attention that followed, I myself didn't read any Chopin until many years later, when a student advisee, working on a project in an education class, asked if she could give a presentation in my course on medieval women's literature. She was so persuasive that I said yes--even though she was working on a short story written by Kate Chopin. Megan's presentation was on Chopin's brief "The Story of an Hour," and she attended my class a week early, her hands full of photocopies, asking students to read the short story before her presentation. (You can read it by clicking here.) It was so short--and Megan herself was so excited--that no one in my class objected. 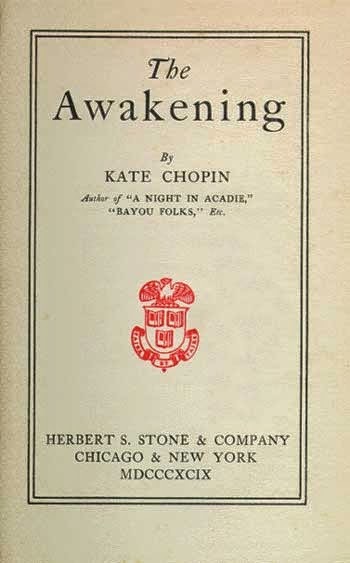 After that, impressed by my student's work with Chopin--and that she could get a classroom full of students to read something, even something short, that wasn't on their syllabus--I decided to read Chopin's novel The Awakening (although Chopin wrote about a hundred short stories, she wrote only two novels). I never thought I'd get a chance to read The Awakening with students, however (since I am a medievalist), but in the year before I retired, I finally had the chance to teach a class in which I could assign not only a "modern" novel (for me, anything in the nineteenth century is modern! ), but also an American novel. I can't recommend it enough. The novel's treatment of race is provocative (and some students found it objectionable), but its view of "traditional marriage" and its anatomy of the fate of a woman who acts on her passion are very compelling. Although you can buy very affordable and well-presented modern editions (I particularly like the Norton Critical Edition), you can also access the novel at Project Gutenberg or at the Internet Archive. There are many great secondary materials about Chopin--biographies and critical studies--but a great place to start is at the website of the Kate Chopin International Society, where you will find an extended biography, Chopin texts, criticism, teaching guides, and information about films, translations, and podcasts about Chopin and her work.